It has 4 separate tracks/circuits. The switches need work and a few sections of track need work. There are no transformers attached/included, only the wiring is there, underneath. Layout measures approximately 4.5'x8'. There is cement and rock on it. The wooden slab underneath appears to be well built, metal bracing and brackets underneath. Has minimal flex and has holes for a U bolt in the center possibly usable for hoisting purposes. It may be sturdy enough to tilt vertically. Has some handles underneath to carry it. Here's some footage I found from 2016 when I had it working. 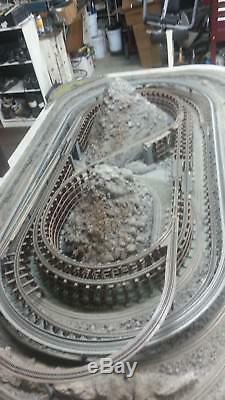 The item "N Scale Train Layout N Gauge 4 Tracks Needs Work" is in sale since Wednesday, March 14, 2018. 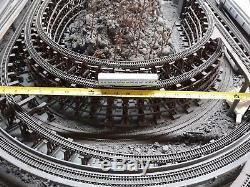 This item is in the category "Toys & Hobbies\Model Railroads & Trains\N Scale\Other N Scale". 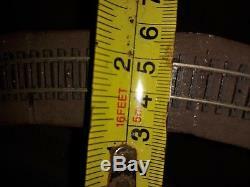 The seller is "klei1051" and is located in Moorpark, California. This item can't be shipped, the buyer must pick up the item.